This year, Pappas Restaurant and The Ed Block Courage Awards have teamed up to develop the “Colossal Courage Crab Cake”, a 10-ounce colossal lump crab cake that was the feature entree selection at the Ed Block Courage Awards Kick Off Event, which was held at Pappas Restaurant in Parkville, Maryland. Guests of the event were offered a few entree selections, including a 14-ounce New York Strip Steak, or Chicken Marsala, as well as the 10-ounce Colossal Courage Crab Cake. Many of the legendary Baltimore Colts were in attendance, including Art Donovan, Ordell Braase, Lenny Moore, Jim Mutscheller, and many more. Also a guest of the event was former offensive tackle for the Baltimore Ravens, Jonathan Ogden. So, how exactly did Pappas come into the picture? Pappas Restaurant and Lounge was established in 1972, when Mr. Mark Pappas took over Wargo’s Steak House and Stag Bar. Over the years, Pappas has become a household name in the Baltimore area. They have won over 10 awards for their delicious crab cakes, including Baltimore’s Best Crab Cake in the City Paper, Baltimore Magazine, and Maryland Life Magazine. They were also featured on the cover of Baltimore Magazine in July 2009, Zagat reviewed them as having an “extraordinary crab cake”, and they were Travel Channel & 98 Rock’s “Food Wars” winner. Word has also traveled up the East Coast, as New York Yankees Magazine named Pappas Restaurant the “#1 Must-Do While In Baltimore”. As word spread, and Pappas Restaurant’s crab cakes were in high demand, Mr. Pappas and his family decided to broaden their horizons, and open a second location in Anne Arundel County, at the Centre at Glen Burnie, in February 2010. Now, they not only have a well-known Parkville location, and a seafood carry-out, but they have expanded south of the Parkville area! Since their crab cakes are so well-known, Pappas also ships their ‘cakes nationwide, so anyone can enjoy them, no matter on which coast they reside, and Maryland residents are able to share delicious seafood with relatives in other states! 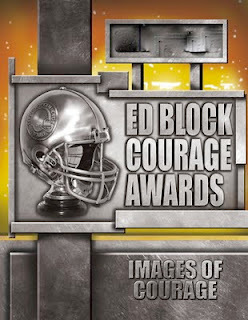 The Ed Block Courage Awards introducing Pappas’ Famous Crab Cake as their Kick Off Event’s entree, and putting the word out to all NFL teams about our great main dish, is quite a great honor. It is also a privilege that Sam Lamantia and the Ed Block Foundation chose Pappas as their venue for hosting the Kick Off Event. “We are so excited and proud to be working with this great organization, and to be giving back to the charity is just amazing,” said Justin Windle, general manager of Pappas Restaurant. After the event “kicked-off”, there was an unveiling of the new 10-ounce crab cake. There were “oohs” and “ahhs” from the audience as music played in the background, and a large photo of the crab cake made its way onto the 72’’ television at the front of the room. WJZ Eyewitness News and WBAL were also in attendance, with cameras and microphones in tow, interviewing guests, asking about their experience. All feedback seemed to be positive! 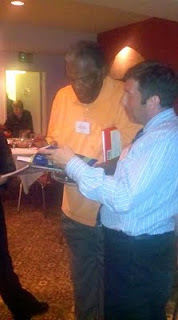 There were a few people who spoke throughout the event, including Justin, Pappas’ general manager. Paul Mittermeier, the director of communications for the Ed Block Foundation, also spoke throughout the event. He announced he took a Colossal Crab Cake to New Orleans Saints head coach Sean Payton. 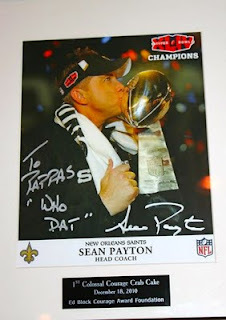 The Superbowl XLIV winner said the crab cake was the best he’s ever eaten, and as a thank you, sent an autographed photo to Pappas Restaurant to put on display! Also, after the ceremony, Lenny Moore, Art Donovan, and some of the other guests were kind enough to stay behind to sign autographs and take pictures with a few of their fans. The Colossal Courage Crab Cake will be available for purchase starting today, June 14, 2011, through our carry-out or to be shipped. The crab cake will be priced at $19.99, and a portion of the proceeds will go to the Ed Block Foundation, supporting in the fight to end child abuse. 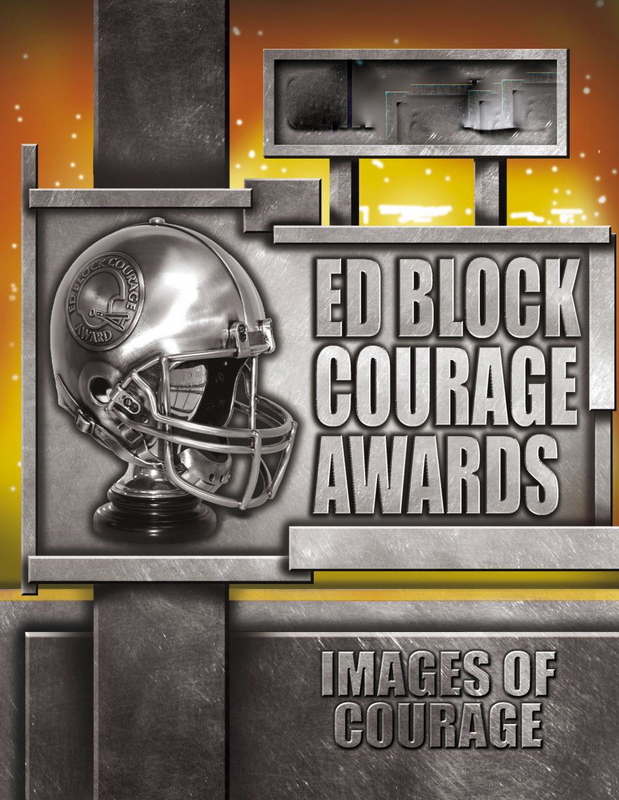 So stop into Pappas and get your Colossal Crab Cake and support the Ed Block Courage Award Foundation--- and your tastebuds! To see a complete compilation of pictures from the night’s event, please visit our Facebook page at “Pappas Restaurant and Sports Bar”. Also, if you’re not already a fan, “Like” us!! 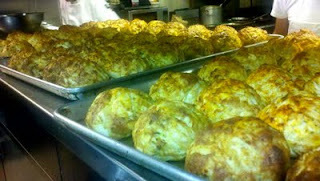 We will be giving away a FREE crab cake dinner when we reach 800 fans!